The month of February is also the celebration of BLACK HISTORY—recognizing the accomplishments and contributions of African Americans from the foundation of America to this very day. I felt it fitting to highlight this concept of LOVE as stated in the heading, not to dredge up painful events but to demonstrate that WRITERS throughout history can—and have—made a big difference in creating harmony in the lives of millions around the world. Do you recognize the name Daisy Gatson Bates? I would have said “no” just a few years ago. However, this publisher, journalist and lecturer played a leading role in the Little Rock Integration Crisis of 1957 and is honored for her lifetime accomplishments in the state of Arkansas on February 19th (or the 3rd Monday of every year) right along with remembrances of George Washington’s birthday and Martin Luther King. As a foster child, Daisy attended the city’s segregated public schools. In her teens, she learned that her birth mother had been raped and murdered by three local white men. No one was ever arrested and hate festered in her. Her father told her: “Hate can destroy you, Daisy. Don’t hate white people just because they’re white.…hate the humiliations we are living under…hate the discrimination that eats away at the South…and at the soul of every black man and woman.…Then try to do something about it.” And so she did. As an adult, Daisy and her husband published a local newspaper, the Arkansas State Press, utilizing her writing talents in her chosen field of advocacy journalism. Stories about Civil Rights ran on the front page as well as the violations of the Supreme Court’s desegregation rulings. However, the main stories that filled the paper spotlighted achievements of the black community in Arkansas. Daisy had turned the painful events of her life into actively supporting those who wanted to change the segregated school system and increase opportunities for everyone. Her clear and organized writing skills and positive attitude eventually led her to a position in the administration of President Johnson, working on anti-poverty programs. 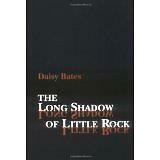 Daisy wrote a memoir in 1962—The Long Shadow of Little Rock—which was banned throughout the South. However, in 1988 the University of Arkansas Press reprinted it, after which it won an American Book Award. President Bill Clinton (then Governor) said Daisy Bates is “the most distinguished Arkansas citizen of all time.” In her later years, Daisy moved back to rural Arkansas, to concentrate on improving the lives of her neighbors (anyone who needed help) by establishing self-help programs that were responsible for new sewer systems, paved streets, a water system and community center. Highlighting this woman’s life and accomplishments—as a person, journalist, publisher, author and advocate—exemplifies the points made by author Francine Rivers in my blog last week. Tell the TRUTH, no matter how messy it is and get the details right. Bad things happen. Ugly things. Sad and malicious things. There is also the TRUTH that good people make a difference. Their concepts of love, Faith, values, and doing what is right because it is right will make a difference. Who is the person (or people) in your life demonstrating this element of LOVE? Can their examples be incorporated into what you’re writing? Do you need to write a True Story/memoir about their lives? What is holding you back? The WORLD needs more examples like this! Write it! Get it PUBLISHED! Next Next post: What makes for a great self-publishing company?